Eskalith is a medicine that is prescribed to patients suffering from bipolar or manic-depressive disorders. It is specifically used to treat the manic episodes. It reduces the frequency and severity of the manic episodes. Eskalith contains Lithium Carbonate as the main drug which is an anti-manic agent. It acts by altering sodium uptake and transport in nerve and muscle cells. It also balances catecholamines in the brain. Modifying the salt reduces the excitation in mania. Keep it in a tightly closed container away from heat, moisture and light. Keep it away from the reach of kids and pets. Take it orally with to avoid GI upset. Use it exactly as directed by your doctor. Take plenty of fluids and avoid excess salt in diet. Dosage varies a lot depending on the formulation, brand, and patient. Kindly consult your doctor for your prescription. If it is time for your next dose then skip the missed dose or else take it as soon as you remember. Do not double dose. Lithium toxicity can occur even at doses close top therapeutic levels. Use caution in severe cardiac, renal and liver diseases, pregnancy. When Eskalith should not be used? 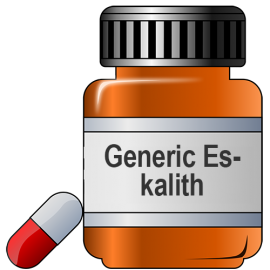 How long should you take Eskalith?